eyelash extensions are one of the most popular trends in the world of beauty. having been worn by celebrities and stay at home moms it is a trend that transcends. 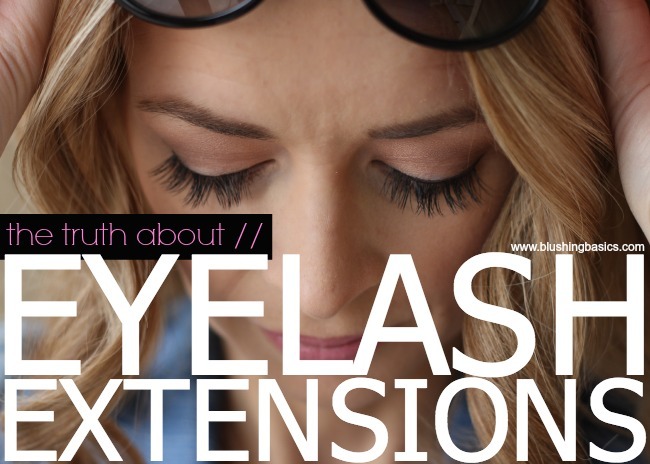 what are eyelash extensions? eyelash extensions are single strands of synthetic eyelashes that are curved to replicate a natural lash. each individual synthetic strand is attached to an eyelash with a permanent glue. (note: this is a specially designed glue for eyelash extensions - do NOT try this at home) the synthetic lash then remains in place until your natural lash falls out. before you freak out about losing lashes please realize that the average person loses about 1-3 lashes per day and it is a natural loss pattern that occurs. i recently visited my salon for a spray tan and was informed of the new lash extension special - a full set of lashes for $50. having dipped a toe in the pool of eyelash extensions a few years ago i was a little hesitant. i tried lash extensions and loved the fact that i always had long dark lashes whether i had applied makeup or not. my lashes looked good in all different circumstances: swimming, working out, waking up, shopping, running around the playground, going on long walks down the beach, drinking (virgin) piña coladas…but i digress. so why was i hesitant? because previously i had the lashes applied by my sister (who was in training at the time) and it wasn't the prettiest of applications, my eyelids ended up getting glued together and as the lashes wore off i looked majorly cray. i'm talking lashes pointing in every direction: up, down, left and right. did i want to go through that again? no, but just like spray tans i was sure this beauty treatment had evolved into a more finely tuned craft. my experience at the salon was a walk in the park. i arrived and was promptly placed on a warmed massage table and laid my head back while the technician quickly and proficiently applied my lashes. i may have taken a nice 30 minute nap and within 45 minutes from arriving, my lash set was complete. they were even, they were straight, they looked gorgeous and my eyelids weren't glued together. the downside is that maintenance is a bit more cumbersome. you do have to take extra care washing your face and particularly washing your eyes. you must avoid oil based face wash and eye makeup products. a mascara wand is a lifesaver in cleaning out eyeshadow debris from lashes as well as straightening any strays. the picture above is after one week of wear and i am two weeks in and still looking good. i do have a tendency to pick at them, which is a major no-no, but i am a picker and it is inevitable. i will admit to having tiny moments of panic because i cannot remove them, kind of like wearing acrylic nails and wishing you could remove them so that you can pop a zit. once you make it over that hurdle, you are smooth sailing. eyelash extensions have improved over the last few years, have become much more affordable, are applied quickly and look more natural. the truth about eyelash extensions is that they are kind of awesome.